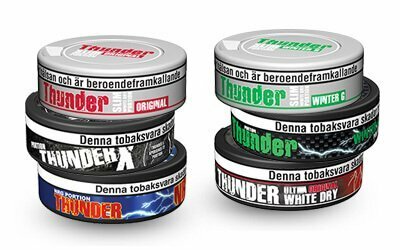 Thunder is a series of snus that consists of 4 different varieties: Portion, Loose, White and White Dry. These come in a varied range of flavours and different strengths. The series is created by the well-known and well-established snus manufacturer V2 Tobacco. The types of snus included in this range are stronger than the average snus, but there is a large amount to choose from and therefore, you are sure to find a strength that suits you. The snus ranges from slightly stronger than the average, to snus that is significantly stronger and more powerful. It is the strength that is the most distinguishing feature of this snus. It has an extra high nicotine content, but also in terms of taste, Thunder is a more powerful snus than many of its competitors. It is made of fine tobacco leaves that are significantly larger than the leaves used for other snus brands. This results in a nicotine content that, depending on the type of Thunder snus you choose, is higher than you are used to finding in a snus box. In other words, this is an excellent choice for those snus users who prefer a stronger snus, which differs from the rest both in taste and effect. These different types of snus come in a variety of flavours, and one, for example, is the so-called NRG flavour. This flavour, as the name suggests, is reminiscent of the taste of energy drinks. It is available in two versions - Portion and White Dry. In addition, there is snus with strong and delicious flavours of mint and menthol, as well as sweet mint flavour, the taste of evergreen and melon flavour. Snus is also available with citrus flavour, cinnamon and cardamom flavour and spearmint flavour. There is also snus with the classic snus and tobacco flavour, and a lot more. In other words, there are types of snus for many different preferences, and they also come in a variety of Portion, Loose, White and White Dry, as well as in many differing strengths. For those of you that like strong snus with powerful taste, chances are you'll find something in the Thunder series that fits you like a glove! You already know that the snus from Thunder is significantly stronger than average and that it contains much higher levels of nicotine. The levels of nicotine range between 11,7 and 45 mg/g. In relation to this it is worth mentioning that the majority of other brands have about 8,5 mg/g of nicotine in their snus, which means that even the weakest snus from the Thunder series is stronger than average. Snus from Thunder is therefore a great choice for those who like a stronger snus with more power. The range of flavours and strengths is so wide and diverse that you can easily find the perfect box of snus for you. No matter if you like super-strong snus or snus with just above average strength, you should undoubtedly be able to find snus that suits you perfectly. Here at Snus Direct you will find most variants of snus that are included in the Thunder series. In our assortment, you will find a wide variety of strengths, powerful flavours and types of snus. For more information about this, just take a closer look at the Thunder section in our assortment, and by clicking on the snus type, you can get a more detailed picture of what they contain. For us, it is a real pleasure to provide you with this tasty, unique and powerful type of snus! We offer a wide selection of both portion and loose snus for sale online. All orders are sent using Swedish Postal Service (Posten) and/or the UPS. Credit card payments are made using secure connections through our payment provider, Paynova. Our warehouse is located in Grebbestad on the Swedish west coast. As we recieve daily deliveries we can always gurantee fresh snus to be sent. What is the Pact Act?